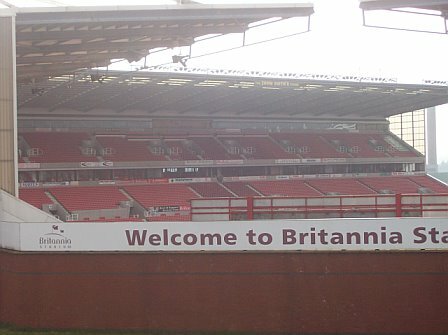 I’ve been to the Britannia about a dozen times in total, the four times with Brighton have all ended in Stoke wins (with different scorelines). 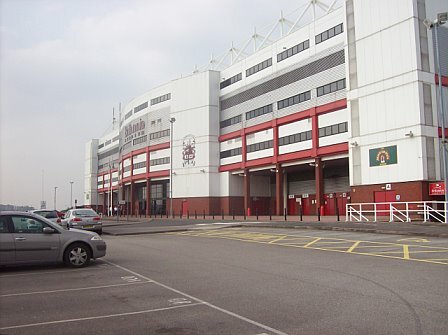 One of the first times I went to cheer on Stoke, was a Carling Cup match against Liverpool – Stoke lost 8-0 – their worst home defeat in 134 years! It’s a ground I don’t have much luck at! 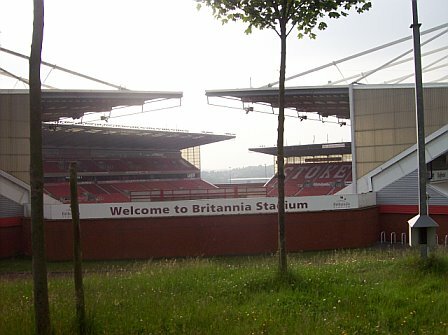 Stoke moved to the Britannia in 1997, about a mile further up the road from their atmospheric Victoria Ground, which was my idea of a ‘proper’ football ground. It lay right in the heart of the community of Stoke, in a sea of terraced houses. 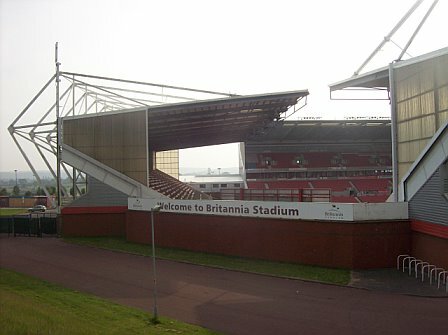 The Britannia, however, sticks out like a lighthouse, high up on the horizon, looking, until recently, somewhat isolated, and lulling away fans to their impending doom (for Brighton fans, anyway). In the last ten years a lot of buildings have gone up around it, but it still looms on the horizon. It was a welcoming sight coming off the M6 at junction 15, being the first thing you saw of the city. Rather annoyingly though now, a big Sainsbury’s depot is now in its way, like someone standing in front of the television. 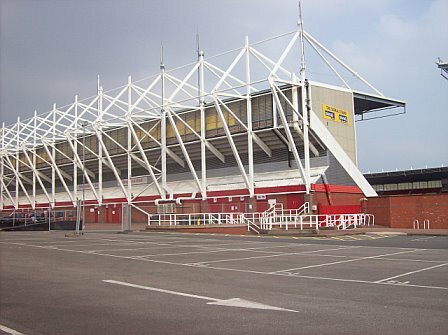 It’s a little known fact that Stoke City are the 2nd oldest League club after Notts County, being founded in 1863. Until 1925 they were just Stoke, as the future city of Stoke-on-Trent was still six separate towns, from North to South – Tunstall, Burslem, Hanley, Stoke, Fenton and Longton. So the team called Stoke really only represented the suburb of what is now Stoke-on-Trent, called Stoke. To give it its full name, Stoke-upon-Trent. Confused? Port Vale obviously represented Burslem, so in 1925 the other four amalgamated towns adopted a football team (or two). Those from Tunstall would ordinarily support Port Vale (ie Robbie Williams). Those from Fenton and Longton, Stoke City. I’m still unsure about Hanley; bit of a marginal seat, I think. 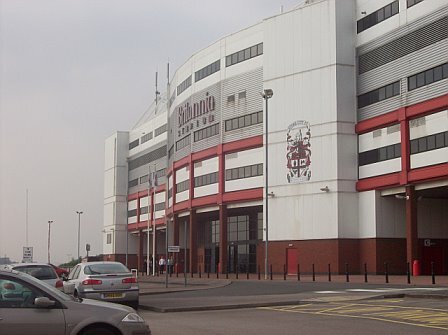 At the time of the clubs inception it was the town of Stoke that was the centre, the hubbub, of the potteries. It’s where the mainline train station was (and still is) and the main commercial area. This was superseded by Hanley over the years, despite Hanley Station succumbing to Dr Beeching’s cull of regional railways in the 60s. It is only recently that the council have started putting ‘City Centre’ in brackets after signs to Hanley, to lessen the confusion of visitors. I imagine lots of people used to, quite logically, follow signs to Stoke, only to find themselves in the small town of Stoke-upon-Trent within Stoke-on-Trent, wondering if the whole City is comprised of just a Woolworths, Stationery Box and a few charity stores. It hasn’t got the style or architectural exuberance of a City of Manchester, Reebok or Kirklees, but I think it has a bit more character than the uninspiring wraparound functional builds that are becoming quite prevalent. The Britannia does retain some individuality, whereas a few built around the same time and later, do not. 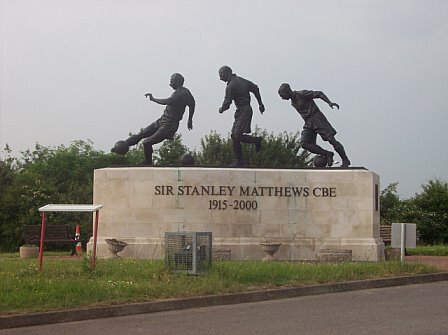 To the left of the Main Stand is a statue of the legendary Stanley Matthews, the Hanley born Stoke and England player who played for Stoke for 15 years; but is probably most remembered for the ‘Matthews Final’ of 1953, when he helped Blackpool to a 4-3 victory from 3-1 down. He is also famous for continuing to play at an advanced age, making Steve Claridge and Jimmy Case look quite young! At 46 he rejoined his home team and was awarded Footballer of the Year for the second time. He didn’t stop playing until after his 50th birthday. His death in 2000 was followed by a stately funeral cortège through the streets of Stoke, to thousands of mourners. An aspect of the Britannia that a lot of people people complain about is that there are only two sides that join up to wrap around the corner. When I first went I did feel that the empty spaces at three corners of the ground looked somewhat unsatisfactory. However, it has been pointed out to me that at least it keeps the old-stadium tradition of having separate stands for each side, with names that aren’t just arbitrary markers for the ease of ticket distribution. What would be really good is if they put some open seating in these corners, like they did at Maine Road shortly before Man City left. They could then stick the away fans here. It would be just like the old days of terracing, when away fans were frequently shepherded in to the corner terracing, underneath the floodlight, like a reluctant host offering the guest the box room under the stairs. We certainly did that at the Goldstone Ground in the mid-eighties, housing our away fans in the corner terrace next to the North Stand; and off the top of my head, I can think of Watford, Middlesbrough and Millwall who also accommodated away fans in the corner, in those days. At the Old Den there was a sizable area with no view whatsoever behind the 8ft square concrete block supporting the floodlight; and I remember 800 of us huddling together like penguins for warmth, at the back of a large corner of Ayresome Park. 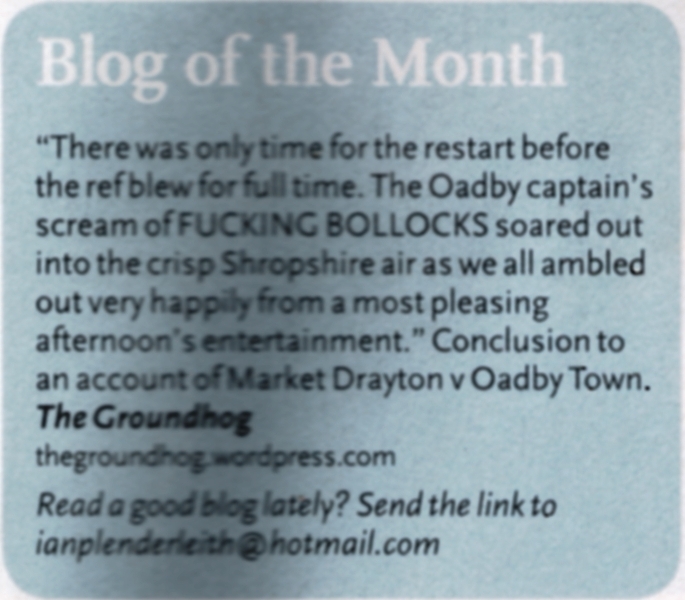 Aah – the good old days of bad hospitality, terrible views and frozen north-east terraces! Anyway, I think it’s a knee-jerk reaction to want the corners of a stadium filled in, like a gestalt perception figure; your brain fills in the gaps itself, but when you look again it looks odd that nothing is there. So the Main John Smith’s stand sits on its own, two tiers with executive boxes between. This is where I saw Stoke’s 8-0 defeat to Liverpool. The view of the annihilation was excellent. The away section is to the left of the Main stand if you’re looking at it from the outside, and has a very generous 4,800 seats. For most visiting teams the bottom so many rows are covered in that orange netting. A classic. The atmosphere can get quite good when the Brit is at least half full. For their play-off match against Gillingham a few years back with 26,000 odd in it was magnificent. Most of the singers congregate in the Boothen End, the name taken from the ‘kop’ at their old ground. You also get a bit of noise from the Sentinel Stand, attached. Their trademark song is Tom Jones’ ‘Delilah’, which is a bit peculiar, and I’m still unsure of the reason why, if any. It is a bit surreal to hear thousands of blokes singing this song, complete with the laugh that goes with it! It’s a bit like hearing a straight-laced friend doing karaoke. 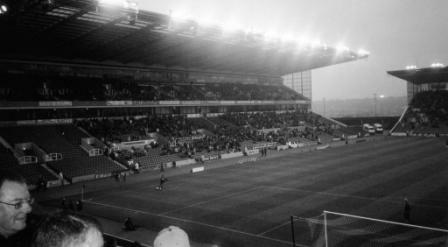 Stoke City have a lot of fans. Their average crowds aren’t up to much nowadays, but they do do a few £5 a game fixtures each year – luckily for me one of those was Brighton a few years back! These special offer days usually go down really well with a guaranteed 20,000 crowd. It just shows what a lot of fans think of today’s pricing. One thing I’ve noticed while living here is that Stoke City seem to have a lot of local support. It seems to have a much lower than normal rate of glory hunters supporting Chelsea, Man Utd and Arsenal. I used to live in Stoke (the town) and it seemed like the whole street were Stoke fans. It was good to see. Paying a pittance in return for a hefty wedge of public money which helped to build the Council House just off the A50? yes that will be it.